" A new 'stamp boom' started June 2, 2005 "
Mark my words. Write it down. A new 'Stamp Boom' started on June 2, 2005. I have been writing monthly stamp "Tipster" type columns for about 25 years. In Australia, the USA and Europe. And unlike most local dealers I get European and USA magazines airmailed to me as they come out, and am more informed than most of what the WIDER worldwide trends are, and the 'big picture'. I've seen all the trends, all the ups and downs, and am certain we are again headed for a 1980 type stamp price boom - this time focused entirely on high end material. Some quite astounding prices are being obtained in recent months for scarce stamps. Not just high prices, but INSANE prices, smashing even the most optimistic expectations. We read here in this magazine each month of record breaking prices for Australasian material. This is a world trend. Two examples from public auctions in June highlight my point. On 2 different continents - Europe and the USA. 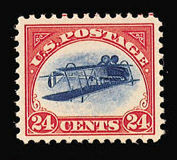 The most dramatic by far was the USA 1918 24¢ 'Inverted Jenny' airmail. This as we all know is a stamp of some legend. It is not even especially 'scarce' as the entire error sheet of 100 was purchased at a Post Office by William Robey and went immediately into philatelic hands at hefty prices. When I attended 'Pacific 97' in San Francisco I took a photo (and published it here) of dealer Harry Hagendorf holding up one of three BLOCKS of 4 of this stamp on his stand for sale! Another dealer had 2 copies, and a European dealer displayed yet another block. 18 examples on sale in one place does not make it 'rare' by any definition. Nonetheless, this stamp gets high prices wherever offered. In October 1998 leading New York auction house Robert Siegel auctioned the Robert Zoellner USA collection - the ONLY complete (by Scott) collection of every USA stamp ever to be offered. The same auction house auctioned the exact same stamp on June 2 this year. The 'Inverted Jenny' was offered with an estimate of $US170,000 - almost the same hammer price it had last sold for. The final price after frenzied bidding was $US525,000 + 10% = $US577,500 or $A778,354. This is without doubt the flashing neon sign that we have entered a stamp boom for top end stamps, the like of which we have not seen for 25 years. Heck this stamp was not even mint unhinged, of which many exist. 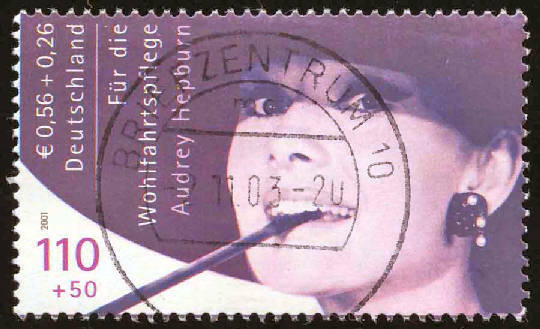 The Hepburn stamp was withdrawn at the last moment because one of Hepburn's sons objected to the design - possibly as an image of his mother smoking was not one he approved of. (Hepburn died of cancer in 1993.) A 37¢ USA Hepburn stamp (without cigarette) was issued without incident in June 2003. A Humphrey Bogart and Ingrid Bergman stamp in the original German set was also withdrawn around this time. The issued set quickly substituted stamps depicting Greta Garbo, and a reel of film. The other 3 issued stamps depicted Marilyn Monroe, Jean Gabin, and Charlie Chaplin. All copies of the withdrawn stamps were ordered destroyed. One sheet of 10 is in the Post Office Archive, and one other in the Post and Telecommunications Museum. Thirty copies (3 sheets of 10) originally sent to the Finance Ministry (BMF) are still un-accounted for. All or some of these 30 Hepburn stamps appears to have been used on domestic mail by someone in late 2003. I am not sure HOW, as the Deutsche Mark officially ceased to be legal tender on December 31, 2001. Existing postage stamps in every euro country remained valid only until June 30, 2002. How these two Hepburn 110 pfennig examples passed through the German mail system near 18 months after I understand they were invalidated is not clear to me. The top left of the stamp does have "€0.56 + €0.26" in a small font, which was a common feature on most (but not all by any means) German stamps issued from late 2001 onwards. So quite possibly such "dual currency" stamps were valid for use in the Euro era? In recent months two used examples of the Hepburn stamps were discovered. The first one was reported by Werner Duerrschmidt in latter 2004, cancelled Berlin October 14, 2003. This was reported as front page news in German stamp magazines dated February 2005 calling it a 'Sensation Perfekt!'. The stamp became quite a media icon, and dealer and collector bodies report the widespread press has proven very positive for philately in Germany. After the national media circus that this initial find predicated, another copy was found, postmarked Berlin November 2, 2003. All readers should carefully check their German kiloware from this era. Almost certainly other used copies exist out there somewhere. Please remember my case of Krug Champagne if you locate one! Well respected German expert Andreas Schlegal estimated the first stamp's value at "€10,000 to €15,000" soon after the initial discovery, and I'd have agreed with that general price for a very recent stamp find. This sale was not helped by some irresponsible and rather stupid German stamp magazine editor. The April issue of leading German monthly "Brief Marken Spiegel" had a feature story announcing a mint sheetlet of 10 had been discovered in England. April 2002. The mint sheetlet was illustrated. Mr Curtis also reportedly bought from the same dealer 3 single mint copies of the withdrawn Bergman and Bogart issue. She supposedly paid €50 for the lot, and she now planned to sell them all to buy a flat. The story claimed all 13 stamps had been pronounced genuine by a British Expertising organisation. The following month a small piece in that magazine mentioned the childish report had been an 'April Fool's Day' joke and was 100% fiction. I bet Heinrich Kohler and his vendor were not laughing, as his auction was about to take place for the used stamp. The €20,000 estimate proved super conservative. I emailed the Auction firm and Dieter Michelson told me: 'final invoice price for the stamp was 69.437,60 Euro, which includes a 17% commission and 16% VAT on the commission.' That is $A112,056 as I type this. This is a price level even major 19th Century rarities often fail to realise. As I said in my opening paragraph - the 'Stamp Boom' started on June 2, 2005 - with that realisation, and the "Inverted Jenny" across the Atlantic - interestingly, both Auctions on the same day. These are astounding prices. Almost impossible to believe. And especially $A112,000 for a used stamp cancelled only 18 months ago. Both results were from major auctions, and clearly the bidding was intense, lifting them to many times the sensible pre-sale estimates. I am hearing reports from all over the place about record prices. Simon Dunkerley advised me this week Harmers of New York had auctioned a USA $5 Columbus on June 24 for a record price. I looked up their website for details, and a day later saw a detailed report in the July 11 'Linn's'. That $5 stamp illustrated nearby has a very obvious short perf at base that the gushing catalogue description does not mention at all calling it 'flawless in every regard'. It is PSE graded 95 from 100, and I have no idea how that high a grade could be assigned, with a top right corner like this, and a short perf. This stamp has a Scott catalogue value of $US9,000 for MUH condition. It sold for $US67,500 plus the 15% "Buyer Fee" or total $US77,625 = $A105,066. That is near NINE times full Scott catalogue value for a MUH stamp seemingly far easier to find than any MUH 1913 £2 Kangaroo. Was the buyer a collector? Quite possibly not - Greg Manning purchased it on behalf of a client, so it may well have been purchased as an 'investment' by someone. Manning purchased 37 of the 290 lots. Manning said: "In my nearly 40 years of conducting philatelic auctions, I have never witnessed such a wide discrepancy between price realizations to the Scott catalogue valuations as in this auction. Realizations of 5, 10, 20 and even 30 times catalogue were commonplace as bidders contested virtually every lot." Numerous large blocks exist of this $5 stamp, Harry Hagendorf showed me blocks of 4, 6 (all MUH!) and 8 at his stand at 'Pacific 97'. He even had complete plate proof sheets of the Columbian issue! I have personally seen complete sheets of 100 for values as high as $1 and there may even be sheets/part sheets of higher values. I have seen covers bearing sets of Columbians, and I am sure have seen illustrated single $5's. The 1913 £2 Roo does not exist on cover or parcel tag, and no larger multiple than a block 4 exists. 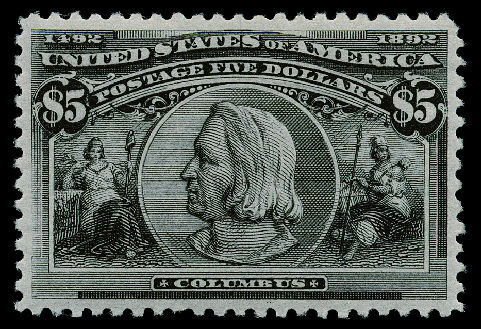 Other stamps in the Columbus series also did very well. The 6¢ violet sold for about 7½ times Scott. The 15¢ sold for $US4025 or about 6½ times Scott. Even the $2 Brown sold for $US25,300 or near 7 times the Scott unhinged mint value. Even the very common 1¢ lowest Columbus value, Scott #230, catalogue $US50 for MUH sold for $US805 (=$A1091) - more than 16 times full catalogue value. This is an exceedingly common stamp and some 450 MILLION were sold. Every schoolboy album has an example. The high value Columbus stamps are like the Australia 1932 5/- Harbour Bridge - with quite low printing numbers, but nearly all seemingly ended up in collector hands, and postally used are not often seen of either. In fact this auction of 290 selected MUH American stamps saw DOZENS of stamps bring 10 times catalogue value or greater. Many bought 15 times or more. A 5c 1891 Postage Due sold for 34 times catalogue. Sold for 57 times catalogue! 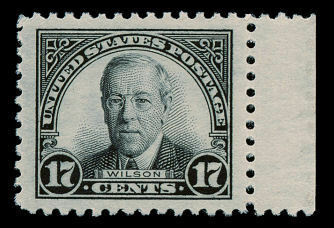 The 1924 17¢ Woodrow Wilson stamp shown nearby catalogues $US24 for MUH and sold for $US1,380 - or more than 57 times full Scott catalogue value for MUH! I would have to agree it is attractive, but 57 times catalog?! Any wide margined stamp of that era from Australia no dealer would ask (or get!) even double normal. In my business I handle hundreds of childhood albums a year in general collections. Most are worth a few dollars each. Stanley Gibbons offered one for sale recently for £29,950 = $A73,377. The reason? It had been the boyhood album of Beatles pop star John Lennon. The album's flyleaf bears the name, address and signature of a young John Lennon. Lennon’s hardcover ‘Mercury Stamp Album’ dates from about 1950, when he was 10 years old. 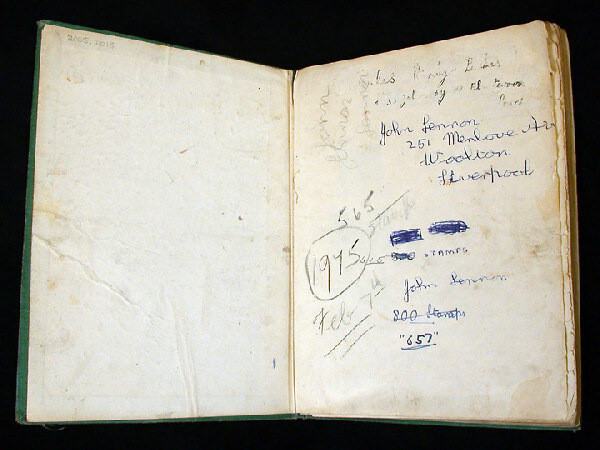 It is inscribed on the flyleaf with his name and address : ‘John Lennon, 251 Menlove Avenue, Woolton, Liverpool’ and signed again ‘John Lennon’ in blue ballpoint pen further down the page. In the top left hand corner are three practice signatures in pencil – his Christian name written once and his surname twice. Lennon appeared to be working on the formation of what would later become a very famous autograph. The album flyleaf is illustrated nearby and is annotated by him with the number of stamps in the album, which fluctuated from 500 to 800. At time of sale it contained 565 stamps over 145 pages, from countries including Australia, India, USA, Germany and Italy. 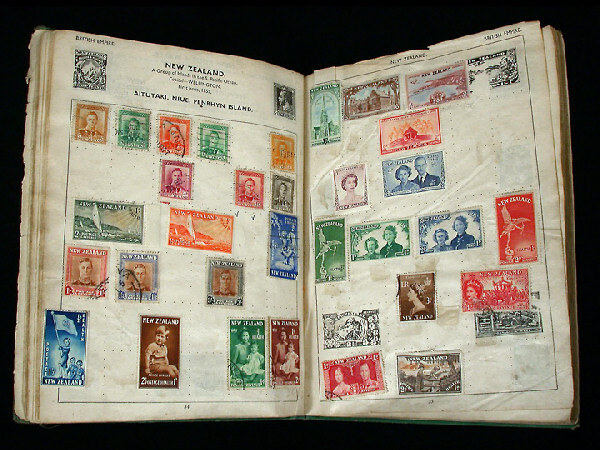 John Lennon's childhood stamp album. October 9, 2005 would have been Lennon’s 65th birthday, and a number of celebrations are planned by fans worldwide to commemorate the event. Lennon was tragically murdered by a 'fan' in 1980 outside his New York apartment building. Freddie Mercury of pop group Queen was also a keen stamp collector when young. His first stamp album was purchased by the National Postal Museum in the UK after his death, and exhibited both at the Museum and at exhibitions worldwide where it has been seen by thousands of fans and collectors. I saw the collection exhibited at "Australia 99" in Melbourne. I emailed Richard Purkis, a Director of Stanley Gibbons as to who purchased the Lennon album they'd had on their website for £29.950. His June 16 reply was: "The Lennon album has been sold. However we are currently sworn to secrecy as part of the deal. I believe that a press release on the purchase will be issued soon and I will forward that on to you." A follow up July 7 received an interesting response from Purkis: "Glen, sadly my lips must remain sealed. The purchaser will be releasing its own press release in due course and we must respect their wishes. I will let you know as soon as I hear anything from them." Despite the 'State Secret' response from Gibbons on July 7, the Smithsonian National Postal Museum in Washington DC publicly announced June 28 that they were the buyer. On the album’s title page, beards and moustaches are drawn in blue ink on the likenesses of British monarchs, including Queen Victoria and King George VI - an early sign of the famous Lennon irreverence! The National Postal Museum plans to begin displaying the album in October 2005 to coincide with the 65th anniversary of Lennon’s birth and National Stamp Collecting Month. Once again, an example of quite insane prices for a boyhood stamp album, that simply would NOT have been remotely possible a year or so back in my view. World interest rates are very low, and many savvy folks feel the very strong recent gains from stock markets will not be repeated in the next few years. Real estate prices have fallen dramatically in major centres such as London, Sydney and Melbourne, and investors bailing out of these markets are looking for an area to enter, with high potential growth. Large firms like Stanley Gibbons and Afinsa are pushing 'stamp investment' on a scale most would not believe. All readers have heard of Stanley Gibbons, but I bet few have heard of Afinsa. In truth Stanley Gibbons are just small part time backyard dealers when compared with Afinsa. This Spanish based firm is easily the world's largest stamp dealer, with sales in 2003 reported to be approx 1 Billion Euros, making SG look like a minnow. Compare this Afinsa turnover to the record year SG just reported, with pre-tax profit rising 42% and annual sales of just £10 million. Afinsa has 2,400 sales representatives, 600 full-time employees, and 200 offices. Afinsa is the parent company of Auctentia, with owns 69% of massive US auction and collectible operator Greg Manning Auctions Inc, which itself is listed on the NASDAQ index. As I typed this GMAI stock had risen 18.6% in the previous 3 months. I am no stockbroker, but to see this double in a year or two from today's $US12 would not surprise me at all. Manning itself is so large it purchased famous auction house H.R. Harmer in July 2004, and now owns a majority share of giant companies like Corinphila Auctions Zurich, Heinrich Kohler Germany mentioned above, and John Bull Auctions in Hong Kong. As well as large USA auctions like Ivy & Mader and Nutmeg. Australians are now allowed to add stamps into self managed Superannuation funds, and I understand from next year Britons too will be able to do this. This has and will open up a massive potential market. I sell a lot of better stamps to clients who ask the invoice be made out to their company used to pay to super contributions. Afinsa is reportedly already holding stamps insured for €1.2 billion (=$A1.93655 billion) in a large safe for its investment clients, or about 83 times more than Stanley Gibbons annual turnover. A sobering thought. That figure is close to the annual nett profit of massive banks like Westpac Australia or Commonwealth Bank Australia. Stanley Gibbons have a VERY active investment department right now, and have announced it is hiring additional staff for this division due to the great success of this area. Stanley Gibbons hold the ace hand as they themselves set the catalogue prices against which many stamps are "valued". And I can see they are making good use of this advantage. The new Gibbons GB 'Concise' catalogue just printed proves the point. Values of the TOP END GB material are up strongly right across the board. Starting right from the basic 1840 1d Black, which is up over 20% mint and over 10% used. The 1840 2d blue is also up about 20% mint and 10% used. And up a whopping 40% with inverted watermark. These are huge rises in one year. Even the 'numbers in Maltese cross' cancel set is up over 40% on the 1d Black, and up strongly on the 2d Blue. 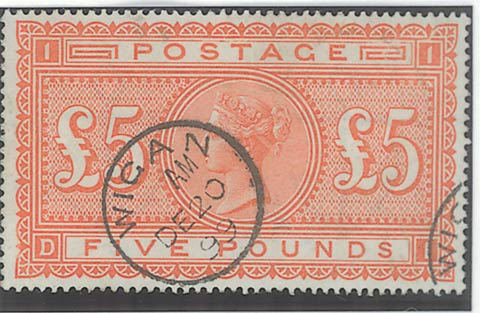 Most important the 'bellwether' glamour stamp is also up solidly - the giant 1867 £5 Orange. Up near 15% mint to £8,000 and near 10% to £3,800 used. And will go much higher yet. Likewise, the QV 1887 £1 Green is up near 20% mint to £4,750. If you want to see a REAL increase on a 20th century stamp, the 1910 KEVII 2d Tyrian Plum rockets up 50% to £60,000, taking the Gibbons value to 3 times what it was just 3 years back. Many of us saw all this happen 25 years back with each new SG Catalogue appearing, and I get a strong feeling of Déjà Vu. Mark my words - you will see this same pattern occur for several years to come in SG catalogues. The bold graph on their "Investment" webpages depends on this occurring. The lesson? Buy the stamps you need NOW in this better grade of material. The common $5 items will likely still be $5 in 5 years time. The $500 item might however become $1,000, and the $5,000 stamp might be $15,000. Or more. And the same money in the bank will have gone up only 20%-25%. As an example of how easy the pricier material is to sell, I recently set up a 'rarity' page offering choice single items and covers priced mainly over $1000. Shameless plug, but many items sell in a day or so of listing them - glenstephens.com/rarity.html - and other dealers report the same experience with top shelf material. Want to see (or print out) this column EXACTLY as it appears in 'Stamp News'? If so click snaugust05.pdf ( This is a 4MB file) If you want to download the pdf just "Right mouse click on the link and select SaveAs." You will need the free Adobe Reader program installed to view it. To order, click here. To read ordering instructions, click here. Email me: or click HERE - regular specials+updates then sent to you FREE!